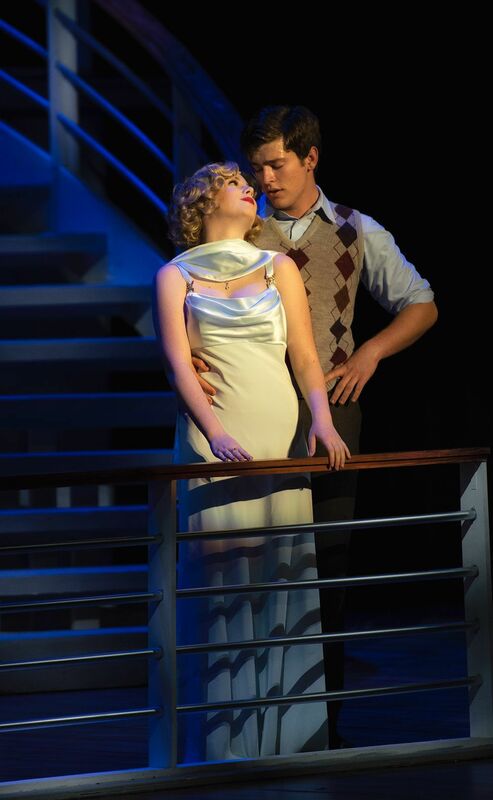 Mackenzie Powell (left) and John Tietsworth as Billy Crocker and Hope Harcourt, in “Anything Goes,” at the Charlotte Performing Arts Center in Punta Gorda, on Sunday, March 31. Morgan Draper performs as nightclub singer Reno Sweeney. Daniel Yousif (left) and John Tietsworth as Moonface Martin and Billy Crocker. Morgan Draper (left) and Jacob Bergmanis, as Reno Sweeney and Lord Evelyn Oakleigh. Charlie McAtee (left) and Morgan Draper as the Ship’s Captain, and Reno Sweeney. The cast of “Anything Goes,” returns for a curtain call, at the Sunday, March 31 performance. The final performance will be at 7 p.m. today, April 5. Isabella Lawrence as Emma, gains the attention of a group of sailors. Morgan Draper (left) and Daniel Yousif, as Reno Sweeney and Moonface Martin. Charlotte High School Troupe 0922 performed Cole Porter’s “Anything Goes,” directed by Bill Olson, on Sunday, March 31, at the Charlotte Performing Arts Center, in Punta Gorda. There will be one last opportunity to see this stunning performance, at 7 p.m. today.